A timeseries of the 20°S-20°N average water vapor concentration, the so-called "water vapor tape recorder." 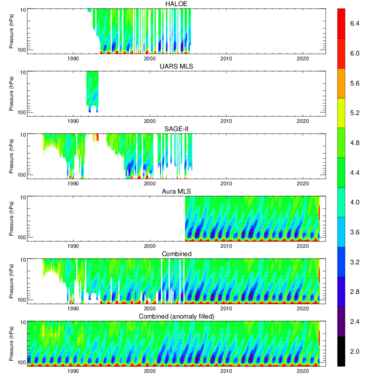 The top 4 panels show the tape recorder signal from individual satellite instruments. The bottom two panels show the combined product (next to bottom) and the combined+filled product (bottom). The Stratospheric Water and OzOne Satellite Homogenized (SWOOSH) data set is a merged record of stratospheric ozone and water vapor measurements taken by a number of limb sounding and solar occultation satellites over the previous ~30 years. The SWOOSH record spans 1984 to present, and is comprised of data from the SAGE-II/III, UARS HALOE, UARS MLS, and Aura MLS instruments. The measurements are homogenized by applying corrections that are calculated from data taken during time periods of instrument overlap. The primary SWOOSH data product consists of monthly-mean zonal-mean values on a pressure grid. In addition to the primary (zonal-mean) grid, SWOOSH data are also available on 3D (longitude/latitude/pressure), equivalent latitude, and isentropic grids. The gridded data include the mean, standard deviation, number of observations, and mean uncertainty from each instrument. Also included is a merged (multi-instrument) product based on a weighted mean of the available measurements. Because the merged product contains missing data, a merged and filled product is also provided for (e.g., modeling) studies requiring a continuous dataset. These SWOOSH data are made freely available to the public and the scientific community, and are the product of extensive research and effort to maintain and improve their accuracy and quality. However, the availability of these data does not constitute publication, and NOAA Chemical Sciences Division (CSD) and their collaborating partners require citable outputs from their research to ensure its continued support. We therefore expect all users of this data to ensure that the responsible scientists receive fair credit for their work, and are offered the opportunity to contribute to the research uses of the data as they deem appropriate. These data are freely available for exploratory analysis. At such time as a journal publication or conference presentation is planned using these data, the PIs (Sean Davis and Karen Rosenlof) should be informed of the nature and aims of the research project and the intended use of the data. Contacting the PIs will ensure they have adequate foreknowledge of the proposed research and thus the opportunity to contribute as appropriate to the use of SWOOSH data in the proposed research project. If the PI makes a significant intellectual contribution to the research, or if the data are essential to the work, or if an important result or conclusion depends on the data, co−authorship would normally be expected. This should be discussed at an early stage in the work. Cite this data set when used as a source: Davis, S. M., Rosenlof, K. H., Hassler, B., Hurst, D. F., Read, W. G., Vömel, H., Selkirk, H., Fujiwara, M., and Damadeo, R.: The Stratospheric Water and Ozone Satellite Homogenized (SWOOSH) database: A long-term database for climate studies, Earth Syst. Sci. Data, doi:10.5194/essd-8-461-2016, 2016. Three plot types are available. Select a value from each menu following a chosen plot type to browse that data.